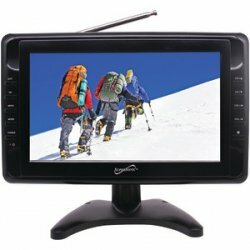 This 10-inch portable TV includes a digital-TV tuner, a built-in rechargeable lithium battery and telescopic antenna. Supports mobile movie files on USB stick or SD card. Watch TV on the go with the Supersonic 10 in. Portable LCD TV. Featuring a built-in digital TV tuner, rechargeable battery and remote, it has everything you need to watch your favorite shows anywhere, anytime. Plus, it features USB and SD Card inputs for taking movies, music and more with you. I found your website browsing online and i just wanted to say its wonderful you have the perfect gifts for my hard to buy for family.